One day in 2015, a small Israeli spacecraft will land on and reconnoiter the moon, joining the United States and former Soviet Union in the world’s most exclusive extraterrestrial club. That vision is not fantasy or chauvinistic braggadocio, but the sober prediction of Israel’s most experienced engineers and space scientists. According to the leaders of the SpaceIL (for Israel) project, the unmanned micro-spaceship will pack more instrumentation into a smaller and lighter capsule than ever achieved before. During a visit to Los Angeles in mid-February, Yariv Bash, founder and CEO of SpaceIL, and Ronna Rubinstein, the chief of staff, outlined the genesis, scope and anticipated impact of the moon mission. In late 2010, Bash heard about the Google Lunar X competition, which offered awards up to $30 million for the first team to land a robotic craft on the moon that would perform several complex missions. For one, the craft had to move 500 meters (1,640 feet) from its landing site to explore the moon’s surface – or send out a search vehicle to do so – and beam high-definition videos back to earth. 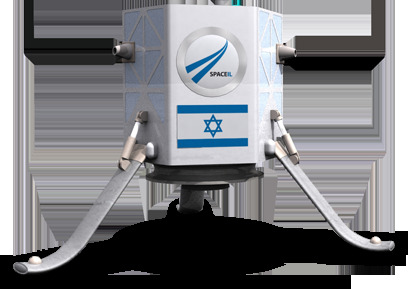 Bash, an electronics and computer engineer, said that SpaceIL will traverse the distance in one spectacular jump. SpaceIL, by the way, is only an interim name and when the time comes will be replaced with an official designation. Initial names suggested by the project staff include Golda, for the former Israeli prime minister, Ramon, for Israeli astronaut Ilan Ramon, who perished in the Columbia shuttle disaster, and Hatikvah, Hebrew for “hope” and the title of the Israeli national anthem. As soon as Bash absorbed the details of the Google competition, he posted one sentence on Facebook, asking, “Who is coming with me to the moon?” Among the first respondents was Rubinstein, a lawyer who now oversees the project’s organization, marketing and fundraising. The total estimated cost for the project will be $30 million, of which $20 million has been raised so far, primarily from industry and private contributors. The Israeli government has allotted funds for 10 percent of the total cost, the maximum a government can put up under the contest rules. According to Israeli statistics, the government money will be well spent, since for every $1 invested in Israel’s 10 satellites and other high-tech research, $7 are returned in civilian and commercial applications. The prize for the winning entry is $20 million, with another $10 million available in bonus prizes for accomplishing different aspects of the mission. But it’s not the prize money that is driving the 11 full-time staff members and some 300 professionals who are volunteering their services evenings and weekends, after finishing their regular day jobs. In any case, any money won will go to schools to enhance math and technology programs. “What counts for us is the impact the moon landing will have on Israelis and Jews around the world, to show what Israel is and what it can do,” Bash said. Most important is to instill both pride and scientific curiosity in Israeli youngsters, Bash added. Together with the Weizmann Institute of Science, the project has launched a nationwide program of high school visits, which so far has involved 27,000 students. Plans also call for lectures and exhibits in Diaspora communities, and Bash and Rubinstein will address a plenary session at the AIPAC Policy Conference in Washington, DC during the first week of March. Other key partners in the project are Israel Aerospace Industries, Tel Aviv University, Technion, Israeli Space Agency, Ramon Foundation and private companies like Rafael and Bezeq. The Israeli spacecraft, whatever its final name, will compete against 24 other entries, of which 11 will be launched by various U.S. teams. Other competitors will come mainly from Europe and some from South American countries, but none from China, or, for that matter, Iran. Early favorites are entries from the United States, Israel and Spain, Bash said. At liftoff, it will weigh 120 kilograms (264 pounds), but on landing, after burning off its fuel, it will weigh less than 40 kilograms (88 pounds). To get into orbit, SpaceIL will piggyback onto a commercial rocket, either American or Russian, at a cost of between $3 million to $5 million. To Israelis watching the moon landing from 239,000 miles away, “it will be the most exciting reality show of all,” Bash hopes. Israeli supporters of SpaceIL already have their own inspirational motto, taken from Theodor Herzl’s words as he prophesized the future creation of a Jewish state.